Fertile land is limited and the demand for agricultural products is high. Farmers attempt to get the most from their land or in other words optimize their productivity. Depending on the type of plant, farmers follow certain rules for plant depth and spacing. For example, tomato plants are often spaced about 12" to 16" from each other in a row and there is about 3 to 5 feet between rows. 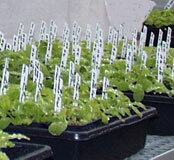 Farmers know that not enough space between seeds or transplants is known as crowding, which has negative effects on plants. Learning how crowding affects animals and plants can help us to distribute the population or resources more efficiently and reduce the harmful effects of crowding. In this project you will study the effect of crowding on a certain plant. Material needed for your experiments can be found at home or purchased locally. You will need at least 6 weeks for your experiments; however, you may choose an experiment or a plant that needs a longer time for growth and observations. More details or support for this project is available for the members of ScienceProject.com web site. Material needed for your experiments can be found at home or obtained locally from hardware stores or garden suppliers.